Ozhotels is a group of independently owned and non-related hotels, motels and serviced apartments located across Alice Spring, Australia. This is not an internet travel agent. Ozhotels allows you to deal directly with the hotels with absolutely no agent involvement giving you the best possible rates for these hotels. Why deal with an internet travel agent when you can book online directly with the hotels and save save save!!! Thousands of interstate and international come to central Australia and Alice Springs every month, and for this reason the city has developed a wide variety of holiday apartments, hotels, motels and resorts in order to cope with the large numbers of tourists. With such a large selection of places to stay choosing the most appropriate accommodation in Alice Springs can take up a lot of your precious time. For this reason many people prefer to use the services of an accommodation expert like OzHotels to get the perfect place to stay which suits their particular needs and travel budget. This service will allow you to compare hundreds of different properties in central Australia and ensure that you get the most appropriate one for you. The main benefits of booking through OzHotels is that you can book your stay up to 12 months in advance and that you will get an extra discount off the already cheap rates wheneven you stay for more than 2 nights. So why not save yourself a lot of time and hassles by booking your next trip to Alice Springs directly through OzHotels. Alice in the Territory Hotel in Alice Springs offers a variety of hotel rooms nestled against the magnificent MacDonnell Ranges and only 2 kms from the Alice Springs city centre. Guests can experience the rugged beauty of the Australian Outback in Australia's Red Centre whilst still being close to shopping and sightseeing. The Alice in the Territory provides all types of travellers with discount accommodation in Alice Springs. It also features a wide range of modern amenities and services such as lounge bar, business centre, conference centre, direct internet access, disabled facilities, faxing facilities, free car parking, guest laundry, restaurant, spa, outdoor swimming pool, tour desk, bbq, airport shuttle and daily housekeeping. This beautiful landscaped hotel offers good sized, comfortable accommodation at affordable rates in a spectacular location, resort facilities and onsite dining at the signature restaurant. The Desert Palms Resort provides self contained studio villa apartments fronting the majestic Todd River only 5 minutes from the Alice Springs city centre. The Desert Palms Resort is a tropical paradise in the middle of the hot dry desert, a peaceful setting with over 700 palm trees and trailing bougainvillea creating a colourful relaxing calming atmosphere. The Desert Palms Resort in Alice Springs is close to everything that the city has to offer, as well as having a numerous guests facilities and services including direct internet access, disabled facilities, free car parking, guest laundry, outdoor swimming pool, tennis court, tour desk and bbq facilities. After a hectic day of travelling you can relax in the privacy of your own balcony while partaking in a light refreshment at this fabulous tropical resort in the very centre of Australia. The Desert Rose Hotel Alice Springs is the perfect base for a Central Australian holiday. Centrally located within easy walking distance to Todd Mall, pubs, cafes, restaurants, galleries, post office, banks and supermarkets. Conveniently located near the Greyhound & Mc Cafferty's bus depot and Alice Springs' famous "Ghan" train station is also only a short walk away. Our Alice Spings hotel accommodation is ideally priced for the budget traveller, who is looking for clean Alice Springs hotels in a quiet location and close to just about everything. The Aurora Alice Springs provides travellers with a great place to stay for that true Australian outback holiday experience. Centrally located in the heart of Alice Springs it has the shops, cafes and restaurants of Todd Mall on one side and the banks of the famous Todd River on the other. This Alice Springs accommodation is perfect both for corporate and leisure travelers who want to be able to explore the Alice Springs region, including Uluru, Watarrka (Kings Canyon) National Park, MacDonnell Ranges and Lasseters Casino. The Aurora Alice Springs Hotel features a refurbished reception, courtyard and pool areas, as well as a wide range of hotel rooms with something to suit everyone. Guests staying at the Aurora Hotel can enjoy the award-winning Red Ochre Grill Cafe & Restaurant, the relaxing bar & lounge area, room service, daily housekeeping and wake-up calls. The recreational facilities in this budget accommodation include an outdoor swimming pool, spa, barbecue grills, guest laundry, 24-hour front desk, air-conditioning, FREE onsite car parking and internet access in public areas. The friendly, professional staff at the Aurora Alice Springs Hotel will cater to your every needs and are there to ensure that you feel welcome from the moment that you arrive at this delightful accommodation in Alice Springs. 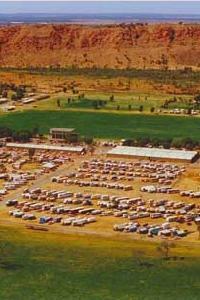 The White Gum Motel is a short ten minute walk away from the centre of Alice Springs. It is within walking distance of the Alice Springs shopping centre, restaurants, Todd Mall, art galleries and night clubs. The White Gum Motel is within close proximity of the golf course, casino, tennis centre, squash courts and the football oval. The Alice Tourist Apartments are perfect for family stays. Each apartment is serviced daily and includes a fully equipped kitchen. The Alice Tourist Apartments have excellent facilities including a swimming pool, guest laundry and off-street parking. 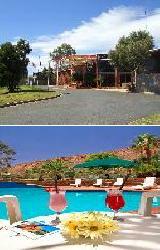 Heavitree Gap Outback Lodge provides 3.5 star accommodation, just five minutes south of Alice Springs. It offers magnificent scenic views of the MacDonnell Ranges. The lodge has impressive facilities including a Tavern and bistro, outdoor swimming pool and a supermarket on property. The Best Western Elkira Motel provides outback hospitality in the heart of the Alice Springs CBD. The Elkira Motel is only a five minute walk away from the post office and local tourist attractions such as the Royal Flying Doctor Service and the Panorama Guth. The motel has an outdoor swimming pool and a delightful Terrace restaurant. The Diplomat Motel is situated in the centre of Alice Springs. It has excellent facilities including a swimming pool, 2 restaurants, a bar, BBQ area and conference facilities. 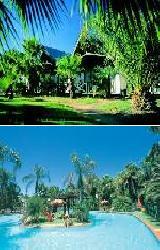 The hotel is also within close proximity of the Botanical Gardens, Flynn’s memorial, Desert Park and the Old Ghan train. Alice Springs Plaza Hotel offers quality 3.5 star accommodation in the centre of Alice Springs, just a short walk away from Todd Mall, the shops, restaurants and nightclubs of Alice Springs. The Hotel has two pools, a bar and grill with an outdoor beer garden, BBQ area and in-house movies. The Plaza Hotel provides a wide range of accommodation options to suit every traveler’s needs. The Novotel Outback Alice Springs provides superb 4 star accommodation overlooking the famous MacDonell Ranges. It is within walking distance of the casino, the Alice Springs Convention Centre and the famous desert golf course. The hotel has fantastic facilities including a landscaped swimming pool and spa, a gym and a bar and lounge area. 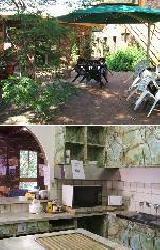 Alice Springs Bed and Breakfast is only a short walk away from the centre of Alice Springs. The guest rooms have en suite bathrooms, heating and air-conditioning. The guest room and library are filled with fine arts, antiques and has an open fire. There is also a swimming pool in the garden. 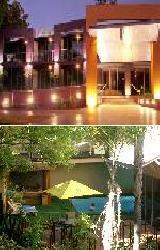 The Lasseters Hotel Casino provides 4.5 star luxury accommodation in Alice Springs. The hotel has superb facilities including tennis courts, a swimming pool, bicycle trails, traditional Irish pub, bistro, reef bar and of course an internationally renown casino. The Crowne Plaza Alice Springs provides stylish 4.5 star accommodation and suits both business and leisure travelers. The hotel offers a range of fabulous facilities including an outdoor pool, sauna, laundry facilities and a health and fitness centre. The Alice Springs Resort offers luxurious 4.5 star accommodation just five minutes walk away from the centre of Alice Springs. The rooms have magnificent views of the Todd River and the MacDonnell Ranges. The resort is also a pick up point for many local sightseeing tours.